'My name is Prajesh Shrestha and I am currently in my 3rd year of the Juris Doctor at the University of Sydney.Upon graduating, I am interested in becoming a legal practitioner. My areas of interest includes family law and conveyancing. I also have a strong and abiding interest in social justice and as such I am undertaking a legal internship at the Public Interest Advocacy Centre performing legal research, client interviews and drafting. In family law disputes, it might be necessary to subpoena medical records of either the opposing party or a third party. 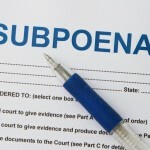 Seeking to issue a subpoena can be a complicated process, and is regulated by court rules of the relevant …..